It all seemed so natural. You went to see the latest summer blockbuster. You became obsessed overnight. 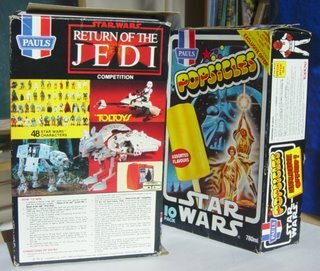 You had to buy the toys, the posters and the swap-cards. 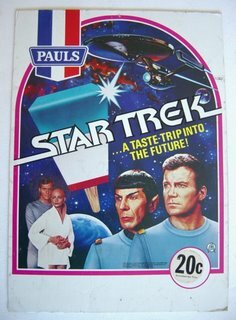 You cut out articles about the movie from magazines and newspapers and kept them in a folder. You bought the cereal and tried to collect all the little bits and pieces you could find. But something was missing. 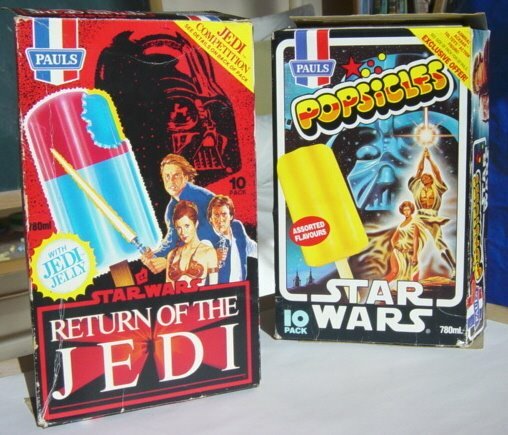 It’s a long hot summer and you need to keep cool. You walk past your local milk-bar, they have a colourful sign in the window – “Return of the Jedi – 30c”! The sneaky marketeers have married you needs and desires, you can now eat your favourite movie, you are sold, sold, sold! One advantage of being the driest vegetated continent on the planet is that you often have an excuse to eat ice cream. Or icy poles, ice blocks or any other type of child’s ice treat. 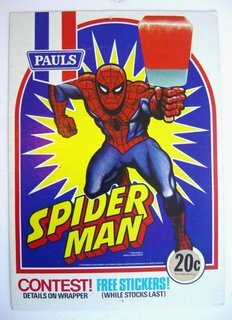 When I was a kid we had an embarrasment of riches on the ice cream front, for whatever movie, TV show or other fad came along there was a licensed ice cream. 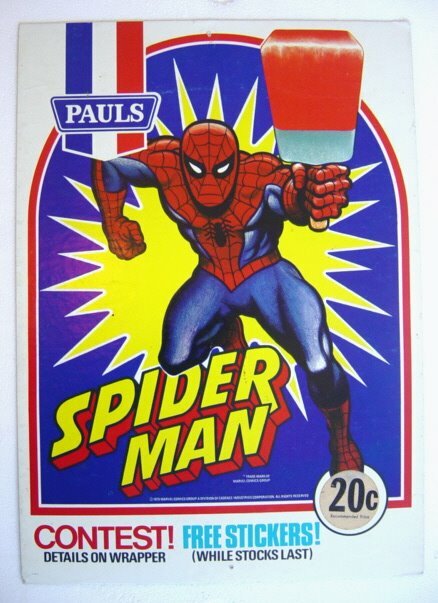 The golden age of ice cream was 1975-85. 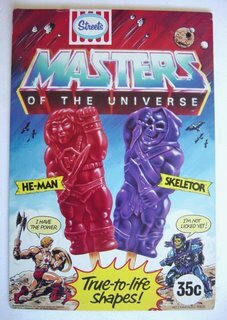 I remember ice creams promoting Kiss, Star Trek, Star Wars, Spiderman, Masters of the Universe and a dozen others. 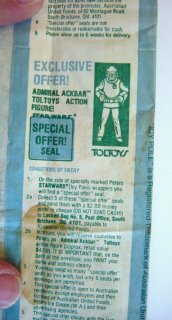 Often the ice creams featured competitions and premiums, like the Star Trek stickers, or Toltoys action figures. Anyway I’m sure you’ve all stopped reading by now and have skipped down to the pics, so I’ll finish up. 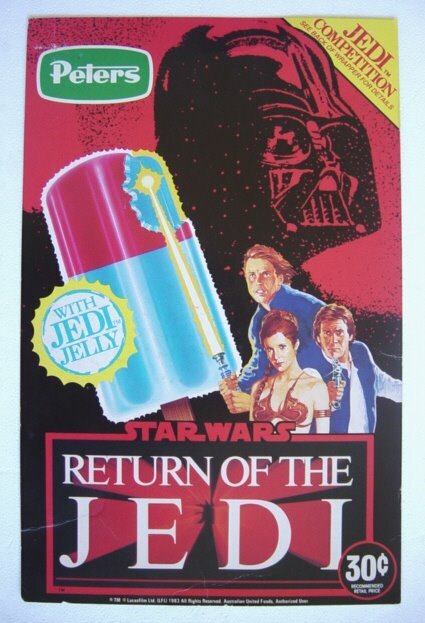 A Jedi-Jelly wrapper (Above) , and Star Wars wrapper (Below). 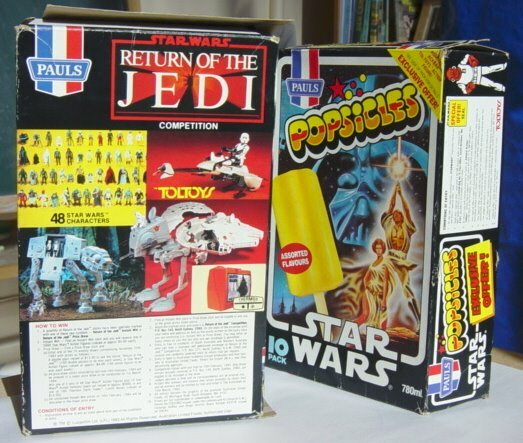 These two are the corresponding wrappers for the boxes shown above. 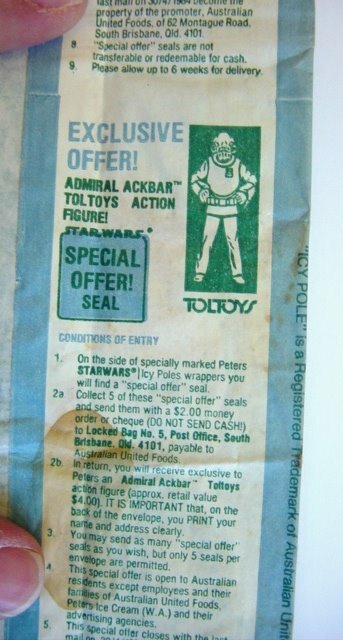 The Toltoys competition details on the rear of the Star Wars wrapper (below). (Below) Star Trek and Spiderman displays, both from 1979. I’m on the trail of more ice-cream items, so stay tuned for future updates!